My DIL is having a Baby Shower this weekend and I have been working on a card to give to my Granddaughter who will be a Big Sister for the first time soon! Her Momma loves Owls & Mushrooms and is doing the new Baby's room in a theme related to that. So I decided to give a shape card a try (for the first time!). I struggled with it and I'm not sure I did the layering right because I didn't understand the "blackout" feature entirely, so I cut out a solid green color using "blackout" and then didn't really know what to do with it! LOL! I eventually decided to glue it down to the inside of the card, because the cardstock I used wasn't particularly heavy and the card seemed too thin. I don't think that is the intention of that blackout piece though...not sure. I am still in the learning stages of the Cricut Machines and have just recently taken up card making, so hopefully this confusion won't last forever! It only took me four days...how ridiculous is that????!! My problem is I can never seem to make a decision. For instance, when I decided to add something to make the Owl look girly, I anguished over the embellishment for hours. I must have tried 100 different flower combos and blingy centers before I finally settled on the "one". I was also apprehensive about adding the glitter on the front, but after cutting out the owl using a pattern background, I noticed that the feather markings just got lost in the pattern, so I needed them to stand out. I'm hoping that the glitter didn't make it too cheesy! The inside of the card was a little cheating on my part, because I really didn't want to cut out really small letters on the Cricut and I didn't have a sentiment stamp to say what I wanted, so I just used Microsoft Word and a cute font (Harrington) to convey the message. 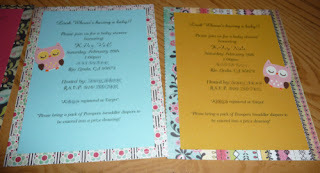 I added a little flourish & flower stamping also to add a bit of coordinating color. You'll have to excuse the stray dirty marks on the inside, I honestly don't know how those got there, but I am assuming I had some excess glue somewhere that smudged. I tried to remove it, but couldn't. Maybe someone out there knows a secret trick/tip to do that...if so, please pass that on to me...cuz I make a lot of mess when I craft! One other thing about the card that left me feeling dissatisfied was the beak on the owl. I just didn't know what to do with it. It doesn't show up too well, but I didn't want to over-do the embellishing or bling, so I left it alone. If anyone has any suggestions to help me with this, I'm totally open to them, as I need all the help I can get! Okay, so this isn't the most elegant looking card...that's for sure, but the good thing is...it is for my sweet beautiful Granddaughter and she will love it just cuz her "Gigi" made it for her! Thank-you for visiting me and sharing in my crafting adventures! Wow! I won a Cricut Cartridge! 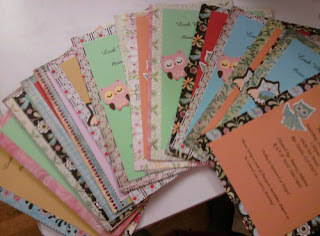 I did a couple of blog hops this past weekend and I won some great blog candy from Cricut Chick (Julie). She has an awesome blog so if you get a chance, check it out! You can use the links in this post to find her or click on her "blinkie" to the right. I can't wait to receive it and use it...Thank-you Julie! My Daughter-in-Law K is expecting our 4th Grandbaby in a little over a month (a Girl!) 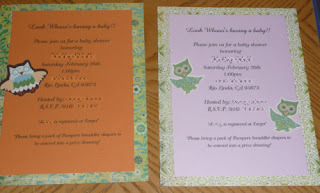 and recently she wanted to make some handmade invitations for her upcoming Baby Shower. She really likes Owls, so she asked me if I had any cute designs I could use from my Cricut Cartridges to help her make them. We found three really cute owls, one from the Create-a-Critter cartridge, one from the Nursery Tails (Imagine) cartridge, and one from the Imagine More cartridge. 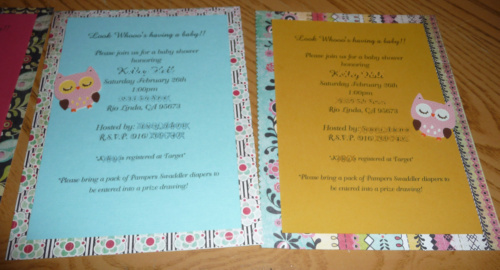 I made a lot of samples using different colors and patterned pieces and put them together for her to choose the one's she liked. Once I finished all the owls, K and her sister completed the invites using cardstock solids & patterned papers and printed the text of the invitation on K's ink jet printer. Here is the finished product...not bad for a couple of amateurs! Of course, I have to give most of the credit to K and her sis. They are just so awesomely creative and they come up with great ideas! I really love the adorable patterned paper that K and her sis picked out...I can't remember what brand it was, but I will have to find out, because I'd like to get some! I'm having so much fun with my Cricut Imagine and am finding lots of ways to make it useful! New Scrapbooking Blog needs Followers! Just wanted to re-post this for a new online friend who is just getting started with her blog and needs new followers! Check it out...she's giving away a great prize when she reaches 200 followers!